In 2016, students of color became the majority of public school populations. Why then, are their teachers so white? My website will explore the barriers facing people of color to becoming teachers, the challenges they face in staying on the job, and the actions communities undertake to make sure that those who educate their children are a part of their communities. Fighting for educators to come from the communities (of color) that they serve gets at the root of systemic injustice; it breaks against the tradition of intervention by “white saviors” or outsiders who think they know better trying to take control of the community. When communities of color advocate for themselves, they fight against the systems of oppression perpetuated by neoliberal reform–an idea I explore in TRUE GRASSROOTS IN AN ERA OF NEOLIBERALISM. My website focuses on Chicago, a city with a rich history of grassroots organizing for teachers of color and the home of the Grow Your Own Teacher Act. As this legislation grew out of grassroots organizing in the city, Chicago gives us a model for how grassroots organizing can yield demonstrable success. For more information on the Chicago grassroots movement, look at ON THE GROUND WITH GRASSROOTS GROUPS: ORGANIZATION SYNTHESIS. With almost 370,000, Chicago is the archetypal “urban” setting. 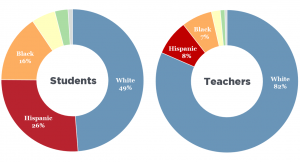 In Chicago, students of color make up about 90% percent of the public school population–and yet, teachers of color make up less than half the workforce (Chicago Public Schools, 2017). My website will explore what communities are doing to change this. 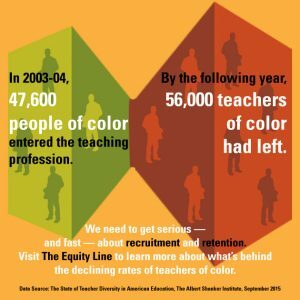 So, why is it so difficult to recruit and retain teachers of color? Teachers of color face an array of challenges thanks to the systematic racism they encounter every day in the classroom. How are teachers of color organizing themselves to make sure that more educators like them join–and stay in–the profession? To learn more, visit the page TESTIMONY AND TRIUMPH: PEER-REVIEWED ARTICLE SYNTHESIS. Recruiting and maintaining educators of color is a battle worth fighting for; after all, teachers of color bring so much to the classroom. They neutralize the threat that stereotypes bring to education, they better understand the challenges facing students of color, and they incorporate perspectives different from the Eurocentric classroom norm. For more information on why we need teachers of color, click on THE VALUE OF TEACHERS OF COLOR: PROFESSIONAL ARTICLE SYNTHESIS. To understand how communities of color are untangling the web of challenges that teachers of color face, consider exploring the different tabs of this webpage. My site honors the work that grassroots groups do every day to bring about social change that often goes unrecognized.